Ten boats arrived for sea training on the Friday and Saturday before the 2017 UK National Championships at Looe. 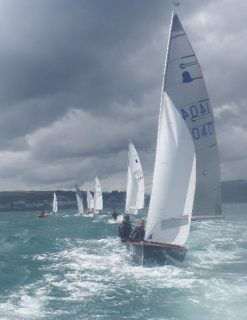 The off-shore wind meant conditions in the dinghy park where not representative of the lively breeze in the bay, which proved to be the case for most of the week! Coaches – Jules Forde (Friday) and Niki Birrel (Saturday) – put together a good program focusing on waves and gates starts that was appreciated by the fleet who were entirely pond sailors. Many thanks go to the coaches, the RIB crews from Looe SC and to Colin Crabb and Enys Dan who helped with the organisation and safety arrangements. In the last two years we have run four UK sea training events and it is good to see numbers growing. We are starting to put together the 2018 training programme and hope to offer two more sea events including something before the 2018 World Championships at Mounts Bay. As always comments and suggestions about our training programme are always welcome.